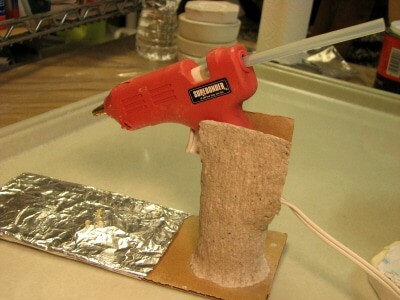 My glue gun (which I adore!) came with a little (useless) wire thing that I was supposed to be able to use to prop it up while it was heating up or while I was using it. But it didn’t work at all for me. I needed something that I could place the gun in while it was heating up (preferably something that could catch the drips of glue) and would be relatively easy to replace the gun in when I was using it. Again, I found making my own thing easier than trying to buy one. It might be easier to cut the cardboard core before gluing it to the cardboard, but that’s not what I did. I hot glued the tp core to the cardboard strip, then cut a 3 1/2 in slice out of the back to accommodate the hand-grip and power cord of the glue gun. I then cut a 1″ slice from the front to accommodate the trigger. Both slices were about 1/4 wide. I didn’t measure these when I was doing it. Just eyeballed it and then adjusted as needed. I then covered the front end of the cardboard with a strip of aluminum foil so I can peel off the glue when it builds up. It keeps the glue gun ready but out of my way and out of danger of burning anything (from laying on a table). Again, not necessarily pretty (tho I did push a bark pattern in the jonni clay) but very functional. To see all of our reader-submitted Practical Paper Mache projects, click here. Very nice one! I could use something like this.